Let the countdown 'til Christmas continue with DAY 3! Forget dashing through the snow in a one horse open sleigh. 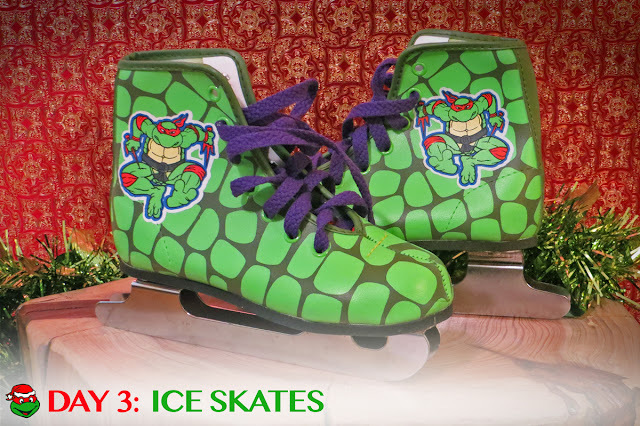 Glide across the ice with TMNT ice skates! The holiday season is the best time to hit the rink and whiz across the ice. A wintery sense of awe takes hold - gliding you across the frosty surface raising your Christmas Day anticipation. Or, if you're like me, and just doing everything in your power not to fall flat on your face. Maybe TMNT ice skates can provide me enough Turtle Power to prevent an embarrassing stumble. They're double-bladed for added stability, sport a nifty shell-like design, and best of all, have purple shoelaces that will leave other skaters green with envy. Oh, the potential! Soon, I'll be landing triple axels and having my own holiday show, Ninja On Ice! It's the holidays, a man can dream. Too bad I'm over 8 years old. The skates won't even squeeze onto my adult-sized feet. Cutting up the ice since 1990, the skates are classic. 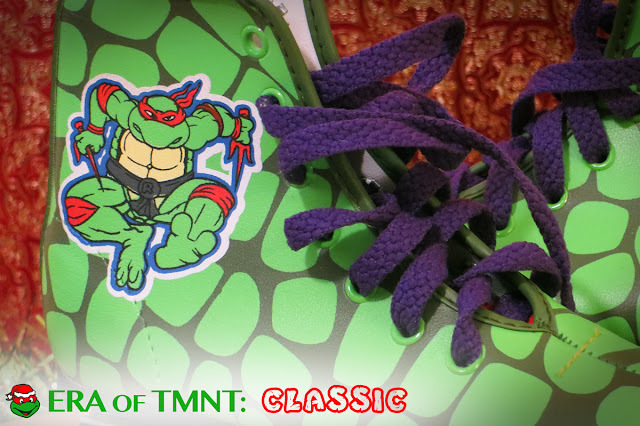 The purple laces along with Raphael's cartoon image are pure 90s magic. Although I recently acquired these, I do have TMNT roller skates (featuring a similar design) from my days as a kid. Even with ice out of the equation, I still hurt myself quite often in those too. Do TMNT Ice Skates from 1990 make a good gift? If you're under 10 years old, they'll have you rocking around the Christmas tree. They're especially perfect for the kids who are experiencing life on ice for the first time. As an adult, they're purely decorative (unless you have freakishly tiny toes). Toss some tinsel on 'em and display those purple-laced beauties. 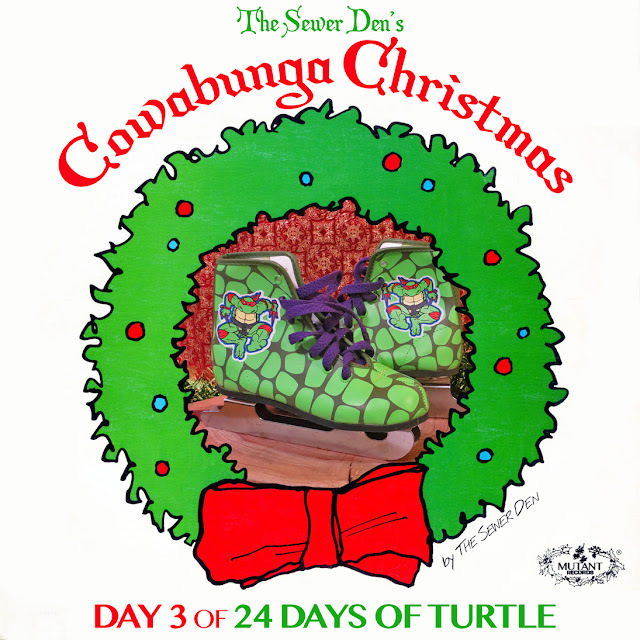 Check back tomorrow for DAY 4 of Cowabunga Christmas! Can't wait until then? Take a trip with the Ghost from Christmas Past to see what The Sewer Den put on display on December 3rd in 2013 and 2014. Now you just need to find a TMNT hockey set and a Casey Jones mask and go rip it up on the ICE ICE BABY. On the ice sliding from one end to the other, Ice skating is sometimes viewed as an art and those that participate in ice skating are greatly admired. The actual activity of ice skating has a long history and has been around for a number of centuries; possibly even before the discovery of metal blades, it is believed that animal bones and wood were used.